Contrary to popular belief, Vikings were not keen on decorating their helmets with horns. Most Viking helmets were some variation of the simple conical nasal helm, like this Medieval Nasal Norman Helm, made from 18-gauge steel. This helm gives good protection for the skull and the nasal bar protects the face from cuts without restricting visibility. The nasal bar on this helmet is secured with rivets, which are used on each metal bar leading up to the conical peak. 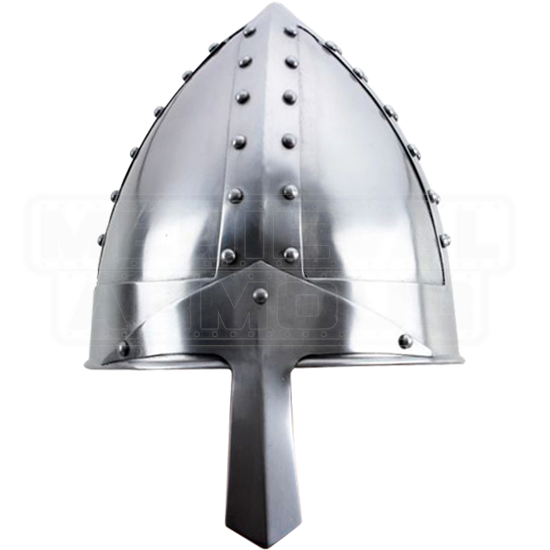 Add some real authenticity to your Norman warrior character with this medieval helmet, ideal for LARP or costume use.